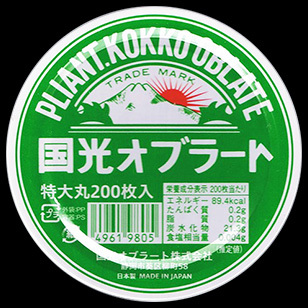 Round shaped wafer paper is the most common type in Japan. Round wafer paper is relatively cheaper than bag type wafer paper, but it takes time to get used to using it. So we developed the "Wafer Paper Assist" to wrap medicine. This "Wafer Paper Assist" is attached to each round wafer paper. It is an originally developed product with a patent so it cannot be purchased from other companies. ●This is an example of how to use a "Wafer Paper Assist." For the directions for the Wafer Paper Assist, please click here. 1. Put water into a glass. 2. Wrap medicine with a wafer paper. 3. Put the medicine wrapped wafer paper into water,remove and swallow it quickly. When wafer paper is soaked into water, the surface of wafer paper becomes smooth and soft, so it is easy to swallow. Once wafer paper is soaked in water, it will melt and tear if you keep holding it. So please take it as soon as possible!! ・ Put the medicine wrapped wafer paper into water and drink it with water. 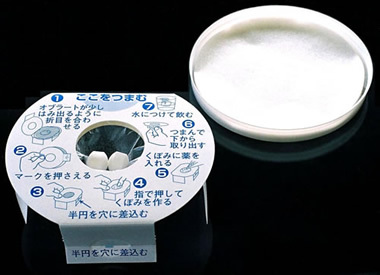 ・ Put the medicine wrapped wafer paper into water and swallow it with water using a spoon. ・ If wafer paper is taken without being soaked in water, it may become stuck and tear inside your mouth or throat!! If wafer paper is stuck and torn, medicine sticks to a throat, and there are risks of suffocating and throwing up. Please put the wafer paper into your mouth after soaking it in water!! ・ When the inside of your mouth is dry, please be sure to drink a mouthful of water before using a wafer paper!! When the inside of the mouth is wet, wafer paper is easy to swallow. If wafer paper is taken without being soaked in water, it may become stuck and tear inside your mouth or throat!! If wafer paper is stuck and torn, medicine sticks to a throat, and there are risks of suffocating and throwing up. Please do not put the wafer paper into your mouth when your mouth is dry!! ・ If there is a high quantity of pills, please drink in several steps!! ・ When bitterness is required for the medicine's effectiveness, do not use a wafer paper since it masks the taste!! Cautions on use and storage!! Wafer paper will melt when water is added!! Keep this item dry!! Wafer paper will easily tear when it gets dry!! Do not expose to sunlight, and place in high temperature or low humidity.